Welcome to Topps Website - " The Hamburger People"
burgers every time. No meat by-products, no extenders – nothing artificial. Just mouth-watering taste with every bite. So cook them up – on the grill or in the pan – and pile on your favorite toppings. Then say hello to a great burger, and goodbye to your hunger. 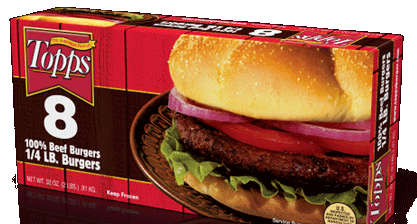 Topps Burgers, a leading manufacturer of frozen meat products, recently brought back its ¼ pound size 100% Beef Burgers. Topps frozen burgers are available in 32 oz. (.91 kg) packages containing eight ¼ pound burgers. 100% Beef Burgers, and the fast-growing line of Topps quality meat products – prepared and quick frozen to seal in both flavor and freshness.